Highway #401 and #416 but also a larger number of fatal crashes and collisions. Lyle & I just drove from highway 15 turnoff at 401 Kingston to Brockville. 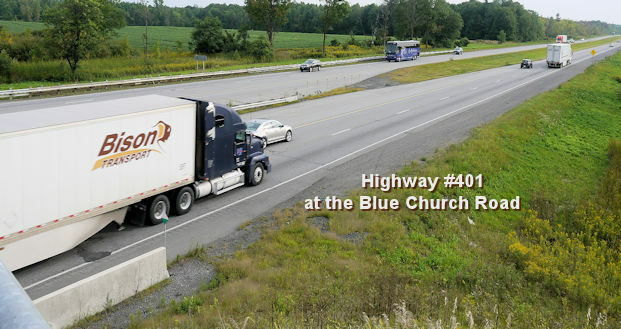 Highway #401 has turned into the most travelled road in North America ! Make a habit of thinking about what calls or texts you need to send before you begin your trip. Before you start the car, take a moment to think about what information you might need during the trip. For instance, program your GPS at the outset, rather than fiddling with it during the drive. Make that call to ask your mom a question before you’re on the road. Text your friend that vital piece of gossip, then put away the phone. The idea of a designated driver has caught on for drunk driving, and choosing a substitute can be just as useful for distracted driving. Select a friend to be your designated texter while you’re behind the wheel. Stow your phone somewhere you can’t peek at it. Try putting it in the glove compartment (lock it if you must) or inside a purse in the back seat. Silence notifications that tempt you to check your phone. Investigate apps that will help boost your willpower. There are several types of apps on the market, some of them free, that allow you to block incoming messages or send automatic responses to let your friends know you’re driving. Practice patience. Consider whether it’s worth risking your safety—and that of others in your car and on the road—to read a text while driving. Then wait until you’ve reached your destination. If you absolutely cannot wait, pull over when you can do so safely. Swerving to the side of a busy highway is never a good option, of course. If you are driving on a road with safe places to pull over, use them to stop and text. According to Mark Edwards, Director of Traffic Safety at the American Automobile Association, somewhere between 25-50 percent of all motor vehicle crashes in the U.S. are directly related to driver distraction as the root cause of automobile accidents. According to the U.S. National Traffic Safety Administration, driver fatigue accounts for about 100,000 accidents every year in the United States, with the greatest risk between the hours of 11 p.m. to 8 a.m. when our circadian rhythms tell our bodies it’s time for sleep. Fatigue drivers experience heavy eyelids, frequent yawning, a vehicle that drifts over road lines, fluctuating vehicle speed, misjudging traffic situations, seeing things “jump out” on the road, feeling fidgety or irritable, and daydreaming. Drunk driving in Canada continues to be a leading cause of crashes despite the increased legislation on fines, driver suspensions, and possible jail time, up to 10 years if they cause bodily harm. On July 2, 2008, new Criminal Code provisions on impaired driving came into force in Canada, which gave police better tools to detect and investigate alcohol and drug-impaired driving. These changes increase the maximum sentence to life if the driver causes death and to a maximum 10-year sentence if they cause bodily harm. Transport Canada defines aggressive driving as speeding, running red lights, tailgating, weaving in and out of traffic, and failing to yield the right of way, among other behaviours. Mar 30, 2019 Two vehicle collision involving a truck has killed one person just east of Brockville on the east bound 401 Highway. Posssible cause could be an ice covered road at the time of the accident. Jan 3, 2019 Grenville County OPP had their hands full Thursday morning with four tractor-trailers crashing within a couple of hours of each other on Highway 401. All the incidents took place between the Maitland and Prescott exits, which is roughly 10 kilometres of road. The first crash was reported around 6:30 a.m. when a tractor-trailer heading west collided with the cement barrier. The other incidents happened around 8:15 a.m. when two westbound tractor-trailers and one eastbound tractor-trailer traveled off the highway and into the centre ditch. No one was injured in these crashes. Oct 9, 2018 A teenager was killed driving westbound on the #401 at Morrisburg when lost control of his car and crossed the grass medium and crashed head-on into an east bound transport. July 18, 2018 A small part of the eastbound lane of Highway 401 was closed after a tractor-trailer transporting freezies caught fire after an apparent collision in the early hours of Wednesday morning. Leeds County Ontario Provincial Police said they were called to the scene in Elizabethtown-Kitley Township just after 1 a.m. The incident took place just between exit 687 and County Road 2 shortly after 1 a.m., according to Leeds OPP. There were no apparant injuries. June 30, 2018 A vehicle with seven occupants was southbound on Highway 416, north of Spencerville, when it went out of control and rolled. One of the occupants died as result of the crash. June 3, 2018 A westbond bus carrying Chinese tourists on the #401 with 37 persons aboard crashes into a rock face at the Blue Church Road west of Prescott. It was reported that multible persons are being transported to hospitals in the area and there were three fatalities. 2018 Two people are killed when driving a SUV at 4.00 am crashed into a transport west of Kingston near Odessa along highway #401. May 3, 2018 A fuel truck crashes into 2 transports and a person from Toronto is killed between Brockvillle and Prescott on the #401 closing both the east bound and west bound lanes. April 14 The driver of a truck lost control and slammed into a rock face causing the truck to explode and killing the driver near Mallorytown on the 401 during an ice storm. April 14 A woman lost control on the 401 near Prescott and was killed. Two other passengers were taken to hospital and treated for serious injuries. SDG OPP said that at around 4:15 p.m., a commercial rental vehicle entered the highway going westbound in the eastbound lanes. That vehicle collided with an eastbound passenger vehicle. An adult man who was the only occupant of the passenger vehicle was taken to hospital with serious, but non-life threatening injuries. The other driver was taken into police custody at the scene. OPP traffic collision investigators are assisting with the investigation and all lanes of Highway 401 were closed in both directions, with emergency detour routes enacted. January 31, 2018 At about 3:30 p.m. , officers of the Leeds County OPP detachment attended a multi-vehicle collision on Highway 401, west of Mallorytown in Front of Yonge Township. The chain-reaction collision involved four cars and seven tractor-trailers during adverse weather conditions. A 23-year-old Scarborough man, who was involved and standing outside of his vehicle, was struck by a transport, said police. He was taken to a nearby hospital and released after being treate for minor injuries. January 24, 2018 One man is dead after he drove off Highway 401 near Kingston January 24, 2018. Police said the man, 71, was travelling east when his car left the roadway and crashed just east of the Joyceville Road exit at about 4:30 p.m. He was pronounced dead at the scene by paramedics, police said. January 12, 2018 Highway 401 was closed for nearly 24 hours in both directions between Cardinal and Johnstown after a serious collision involving several tractor trailers. December 11, 2017 Fatal Crash: Hwy 401 WB at Dixon / Martin Grove exit. Car struck by tractor trailer. One occupant of car pronounced on scene. Full closure all WB lanes of Hwy 401. November 28, 2017 Two people are dead and four others in hospital after a multiple-vehicle collision on Highway 401 east of Prescott on Monday night. Two transport trailers and three vehicles collided in the eastbound lanes of the 401 between Prescott and Highway 416 at 10:30 p.m., according to Grenville County Ontario Provincial Police. A two vehicle accident involving a car and a transport early in the morning on the east bound lane of the 401 near Brockville kills one woman. Two accidents near Gananoque kills two men. The crash involved two cars and a tractor trailer. A Montreal woman died and two other people were injured in a two-vehicle crash Tuesday afternoon near Belleville, Ont. Another person has died in a collision on Highway 401, the second fatal crash involving a tractor-trailer on the same stretch of highway in just over 12 hours. According to the OPP, at about 12:30 p.m. a vehicle travelling eastward on the highway outside of Cornwall crashed into an eastbound tractor trailer. A motorist ended up going the wrong way on Highway 401 because he was following his GPS, Leeds OPP say. The Ontario Provincial Police was called when the driver was spotted going west in the eastbound lanes at Mallorytown A motorist ended up going the wrong way on Highway 401 because he was following his GPS, Leeds OPP say. 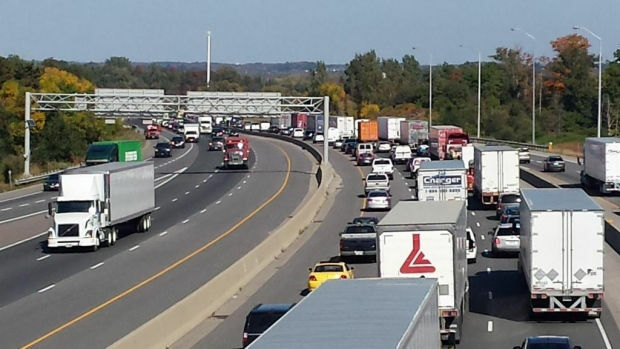 A 32-year-old woman is dead after a six-vehicle crash involving two tractor-trailers on Highway 401 in South Glengarry Township Monday afternoon, Ontario Provincial Police said. A Roll Over car accident in Ottawa has left a 47 year old woman in serious but stable condition following an accident on a highway 416 off ramp to the eastbound 417.